I’m a fan of real carnauba paste wax. Yes, that means, Wax On – Wax off! That also means you can burn 200 calories in one hour and have an amazing looking vehicle. If you’re looking for an amazing, well made wax to keep in your garage when you’ve got the time to really make your car shine, I’d start here. This product from Griot’s Garage, a brand I trust for my car care, packs a high Carnauba wallop. Its proven formula provides rich, bold colors and clarity that will be noticed and appreciated from neighbors and concours judges alike. The paste goes on smooth, providing even coverage, easy wipe-off, and months of steadfast protection. Includes one Hand Wax Applicator Pad. 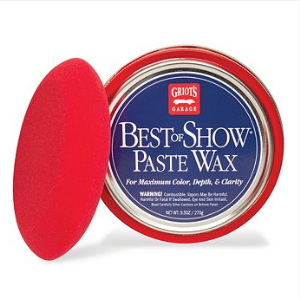 Try it today: Griot’s Garage Best Of Show Paste Wax for $24.99.